Kelty Hearts player-manager Tam Courts has pointed to his side’s immense team spirit and togetherness for their unbeaten start to the Super League season. Kelty made it ten wins from 12 at the top of the table with a 3-1 victory away to Linlithgow Rose last weekend and tomorrow they host champions Bo’ness United at Central Park. The unbeaten league leaders hold a five-point lead over second-placed Newtongrange Star and Courts, although admitting he never expected such an impressive start to the season, is eager to maintain their current run. He said: “I’d be lying if I said I expected us to be unbeaten at this stage. If you look at last season, I inherited an under-performing team and we managed to keep the club in the Super League. 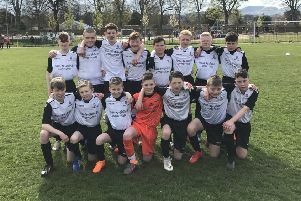 The Fife club went under a total transformation in the close season, with more than ten new arrivals, after ending the past campaign third from bottom and only preserving their status in the division with a play-off against Dalkeith Thistle. Bo’ness are the only side to have beaten Kelty this season – in the Junior Cup third round last month at Central Park – and Courts believes it will be a tough test of their credentials.